As most of you will know I run photography workshops at Hamilton Zoo. My time on these workshops is obviously geared towards my clients, advising and helping them improve on their photography skills and ensuring they have an enjoyable day. If however some unusual behaviour starts to take place, it’s best to just keep quiet and let everyone concentrate on taking photos. On Saturday a baby White Rhino displayed just that. It was an overcast day so the available light was quite low and flat, although this reduced shutter speeds, exposure settings were not too bad as contrast was low. This did help my clients, who were getting to grips with exposure compensation. 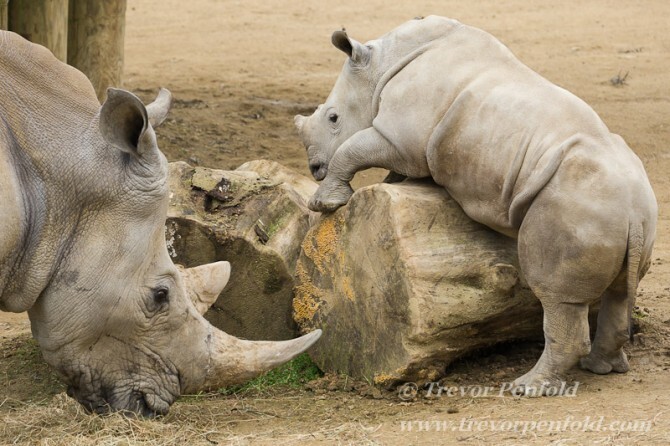 We were photographing the Southern White Rhinos, when a young calf decided it was play time. As the action started to unfold I thought it would be a good time to stand back and let my clients take advantage of the situation. Meanwhile I decided that I would try and get a few shots of my own. As I started to shoot I thought there might be a photo story playing out in front of me. Time was short and the best positions were taken by my clients but I thought I would give it a go. Above, Moesha gets stuck into some fresh hay put out by the keeper, her three-month-old calf (still yet to be named) thought the nearby logs looked much more interesting. As Moesha chomped away the inquisitive little calf circled round the logs and decided it would be great fun to try and climb them. After several attempts the little fellow straightened its front legs and raised its head in triumph. As Mum continued grazing the young calf, now full of confidence, decided to attack the obstacle from a much more difficult angle. They say curiosity killed the cat, but when it comes to baby Rhinos, it just gets them stuck. Still, a good mother always keeps an eye on her young ones. Hooray! 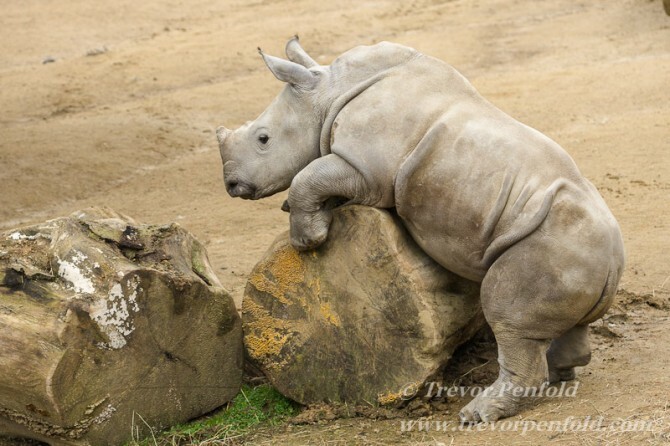 the young Rhino manages to back up and free itself from the clutches of the evil log. That’s enough excitement for one day, as the exhausted little Rhino takes refuge in the safety of Mum's shadow. Photo stories can be a great way for you to focus on your subject, even without the text (which I added for you enjoyment and as a learning tool to give you some ideas), the story is still there. Next time you’re out with your camera rather than look for that one great shot, see if there’s a story to be told. It may well improve your photographic skills and you may even end up with some great shots you hadn’tpreviously thought of taking. Thanks for taking the time to read this article and I hope you found it both inspiring and interesting. Feel free to leave any comments here or on my facebook page here Until next time, happy shooting. Trevor Penfold shares his ongoing photographic adventures here at D-Photo as well as on his blog. For more from Trevor be sure to visit his website www.trevorpenfold.com.